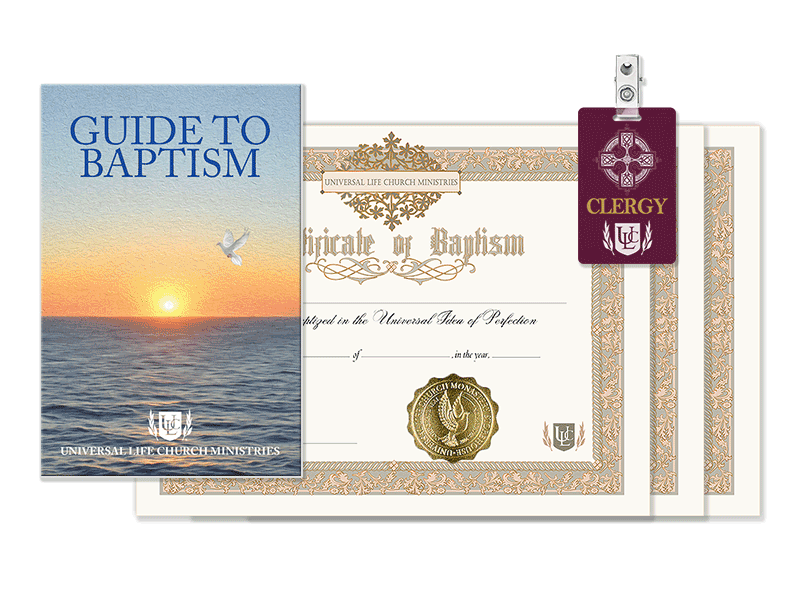 Perform a baptism with help from this kit including the ULC baptism guide book, three baptism certificates, and a clergy badge. Great for first time ministers. Have you been asked to perform a baptism for friends or family and don't know where to begin? As a first time minister this is a wonderful set of basics that will assist you in putting together a thoughtful and memorable ceremony. The Baptism Guidebook is a booklet that will take you through different common practices and give you a great overview of what you will be expected to do at your first baptism. This kit also includes three high quality, ULC ministries baptism certificates with the gold foil church seal and beautiful scroll detailing around the outer edges. These make a wonderful keepsake for the ceremony. Also includes a clergy badge with clip for the minister to wear.